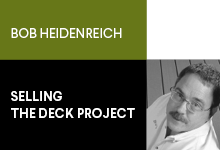 Home Selling the Deck Project Wood is good for deck boards, but are manufactured surfaces better? When I first started out as a deck builder in the 1990s, I created a business plan that said my focus was going to be real wood decking. I was never going to deal in composites. Wow, have things changed. Today, the amount of composite decking sales we’re making at The Deck Store are exceeding the real wood sales. I think that in our industry today, a lumberyard that hasn’t gotten up to speed and is only selling wood, is going to start losing market share. For the interest of this column, I’ll use the term “composites” which in the industry has come to use as a term for all wood-alternative materials including PVC, WPC, capstock, and even stone and cement-based products. Also, I’m referring to just deck surface materials. While I did see advancements in non-wood framing from some companies at Deck Expo in Baltimore, I don’t see us changing our framing from lumber any time soon. With some composites, I still have some concerns of quality, including fading and UV breakdown of products, but most manufacturers have addressed these issues and in doing so have convinced me to carry more composite products. We’re seeing 25-year warranties on many of them now, and some labor-inclusive warranties, with no fade, no stain warranties on these products. We still sell and stock one of the finest cedars in the nation, but customers are becoming less interested in it because of the maintenance involved. The cost of real wood used to be a deciding factor, but today real wood has almost doubled in price. And composites, while creeping up in cost haven’t doubled in price. They’re U.S. made and there aren’t tariffs on the product. They’ve gotten up to speed on the codes and color choices that people want. They can be attached with hidden fasteners, so there’s some ease of use there as well. The thermal properties are still something people have a lot of concern with, but one manufacturer has even addressed that issue. I think we’ve crossed over into a market where composites are taking over, and they’re doing a great job. I encourage you to do all your research before you pick a composite to feature in your store. You’ll want to make sure you can convey to your customers why composites are good for some situations, just as lumber is good for others. People who have historically only worked with wood don’t realize that there is not only a major difference between wood and composites, but there’s also a difference between composite A and composite B. Your expertise in the category will help set you apart from your competition. And don’t worry about trying to carry all manufacturers’ products. I suggest that you partner with one manufacturer. You should show the others in your showroom, but be exclusive to one and you will get the support—including training—from the manufacturer. If you try to feature all the composites, you’ll never be really good at selling any one of them, and you won’t get as much support from any single manufacturer. Personally, I like to display a lot of brands, even if I’m most loyal to only one of them. That helps for situations in which a customer calls and asks, “do you have brand X available?” I’m able to tell them that I do, though I know they may not leave with brand X once they learn about the other brands I stock. I can at least get them to come in and then show them the different brands for comparison purposes. Don’t get me wrong, we don’t short change any company’s products in my store. I make sure that at The Deck Store we say that all products are good, and that some are just better today. Never disparage a brand because you never know when that brand might come out with an innovation that makes them the top product in the category. Loyalty to a specific manufacturer has other benefits as well. In an upcoming column, I’ll discuss how you can leverage your relationship with your exclusive manufacturer to make changes and upgrades to your showroom.